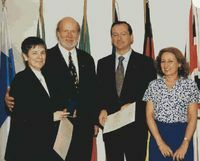 At the occassion of the prize-giving ceremony of the European competition for young consumers in Berlin/Germany on the 29th of June 2001. Nieves Alvarez Martin promoted Consumer Education since 1975 by television, books, kits, software und conferences. Her merits include the design of the "European School of Consumers" (1997), which she heads as a director. She organized conferences for European Consumer Educators in Vitoria-Gasteiz (1992) and in Santander (1999). From early beginnings in 1990 she managed to establish a permanent cooperation with Latin America and the Carribean since 1997 and organized seminars in Chile (1997), Venezuela (1998), Panama (1999), Peru (2000) and Colombia (2001). Some of these activities have been supported by Consumers International and the Government of Cantabria/Spain. Due to her support the news and information service of the European Network of Consumer Educators "NICE-Mail" is also published in a Spanish version.